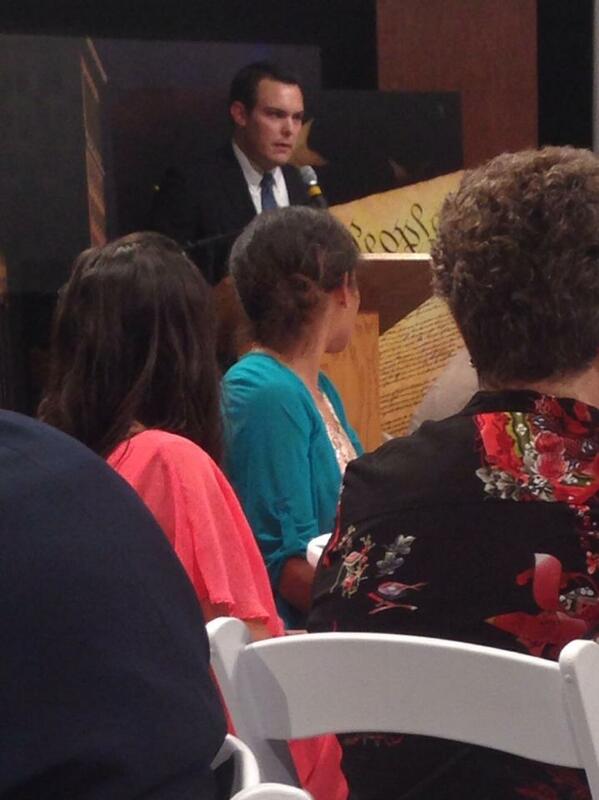 Last night I had the privilege of giving the introductory remarks at A Conversation with the Constitution, a Constitution Day event at KLRN Studios sponsored by East Central Independent School District, Gemini Ink, and the San Antonio Public Library Foundation. Our American Constitution set the stage for an ongoing debate about what our democracy should be. There is no better way to honor that spirit than an examination of the recent groundbreaking Supreme Court decision Citizens United v. FEC, which we will be discussing tonight. The seeds of this case were sowed over a century ago, when the United States faced many problems that might be familiar to some of you. There was unrest throughout Europe and the Middle East. At home, the gap between the richest and poorest was widening. Enormous corporations were exerting their influence over the American political system to protect their monopoly power. A group of Progressive Era reformers led by President Theodore Roosevelt were able to minimize the political influence of corporations by prohibiting direct corporate contributions to political candidates. While this law has stood the test of time, you still meet people every day who feel that the deck is stacked in favor of corporations and lobbyists and against folks like you and me. A lot of them will cite the Supreme Court’s groundbreaking decision in Citizens United v. FEC as evidence of this. Just as 100 years ago, folks are beginning to lose faith in the basic American bargain: that if you work hard and play by the rules, you will have a shot at success.But there is reason for optimism and a light at the end of the tunnel because the students in this room will solve our challenges just as the Progressive reformers addressed theirs. The Citizens United case started with, of all things, a movie. Seven years ago, Senator Hillary Clinton was the front-runner over Senator Barack Obama to become the next President of the United States. In fact, many believed her to be “inevitable.” A small nonprofit group with funding from corporations called Citizens United wanted to release what they called a “documentary” film- one that was very critical of Senator Clinton. Unfortunately for Citizens United, there was a law on the books that prohibited corporations from engaging in “electioneering communications.” This meant that corporations were not allowed to independently spend money to put an ad on TV or in a newspaper that was meant to endorse or oppose a political candidate. Does the First Amendment guarantee free, unlimited speech in all contexts? Do corporations get the same constitutional protection that you and I do? Should the First Amendment guarantee equal access to free speech? There are those who believe that the law prohibiting corporate electioneering prevented corporations from exercising free speech rights. There are others who believe that too much corporate influence in our political system will corrupt it- and that this is a compelling reason to prevent corporate expenditures. The Court decided that corporations can independently spend as much money as they want to support or oppose candidates, as long as it is independent. Corporations still can’t give money directly to the candidates themselves. There is an old saying- “money in politics is like water on pavement- it will find its way into every crack and crevice.” Think about it, it’s true. Tonight, we will be discussing what role the government should have in regulating the flow of money into our elections. We will not answer these questions tonight. In fact, we will likely walk out that door with more questions than we had when we walked in. That is the brilliance of the American Constitution. Happy Constitution Day. Currently, San Antonio lacks the regulatory flexibility needed to unleash innovation in the transportation industry. Even though City Council recently amended Chapter 33 of the City Code, which regulates vehicle-for-hire services, progress and marketplace disruption demand that we revisit its contents. To open the doors for innovation in the transportation-for-hire industry, the City Council should adopt policies that: 1) level the playing field; 2) encourage competition; 3) ensure public safety and consumer protection; and 4) provide access for all of our residents. Uber exists as a mechanism to streamline processes, making urban transportation more convenient for every party involved. Uber has even used market forces to protect the public (a novel concept!) because consumers know more about a driver because of information available about each driver on the app. Critics of Uber are ostensibly attempting to “protect the public,” but are actually just safeguarding their own…oligopolies of urban transportation. My time working for Councilman Nirenberg has changed my perspective slightly, but I wholeheartedly support his proposal.